HEULE's New MICRO Series Tool! Heule introduces the NEW MICRO COFA Series Carbide deburring tool for all purpose deburring of through holes 2mm-4.1mm (.080“-.161“), front and back, in a single pass. Heule’s MICRO COFA deburring tool is the answer for today’s manufacturers requiring more simple and flexible solutions without sacrificing quality or tool life. 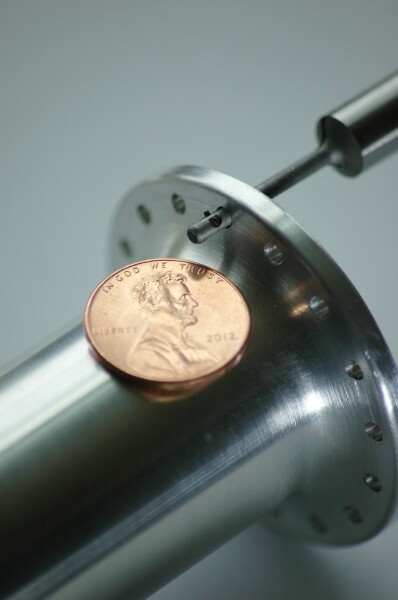 MICRO COFA is a very simple tool for deburring through holes on even or uneven parts from the top and bottom without reversing the spindle, dwelling or indexing the part. Despite the tool’s small size, the MICRO COFA offers a simple to use, high quality deburring tool with Carbide inserts coated with TiAIN to meet roday’s manufacturing needs.